Custom Foam Solutions | Foam Services - Pomona Quality Foam, LLC. Everyday items -- like office chairs, fine furniture and bedding -- are comfortable and durable thanks to one key component: foam. Because foam components are so important to the success of a product, inconsistent quality and late shipments can increase lead times and drive up costs. When it comes to foam fabrication on the West Coast, only one foam fabricator can guarantee quality and on-time delivery: Pomona Quality Foam. Manufactures in a wide range of industries rely on us for foam parts. We use sophisticated CNC technologies to cut and laminate foam parts for home, hospitality, and patio furniture, car seats, mattress toppers and much more. No one ships foam parts faster than we do. 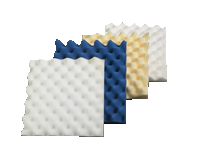 To receive precision foam compontents,laminations, fiber,foam rolls, pillows contact Pomona Quality Foam. You'll receive a response to your inquiry within 24 hours. ©2016-2019 Pomona Quality Foam, LLC.